As always, thanks for your time and help. I ran into this coral yesterday at a LFS. 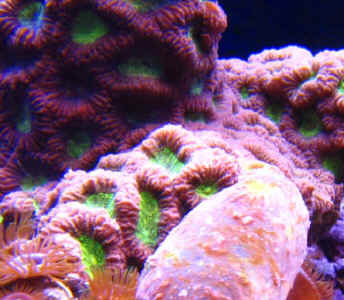 It is a candy cane coral which after some Google research I believe to be a Caulastrea furcata family Faviidae. However, there seem to be many, many, many different versions of this coral ranging anywhere from $15-40 for a 2-3" frag. The LFS wanted $50 for one head which I thought a bit steep but truth be told, I have never seen a candy cane coral with this much color and vibrance. The center is a bright neon green, the rim a slight purple, and on each head it has bright white stripes. 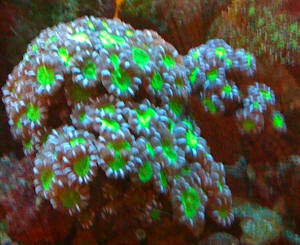 I have attached a picture so you can help me identify the coral in case I have ID'd incorrectly (very possible). The other question is, knowing that beauty is in the eye of the beholder, is $50 per head a fair price tag? 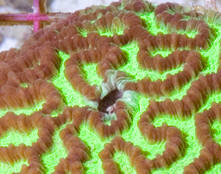 PS - the attachment is a bad iPhone shot of the actual coral, the link is a shot I found online that looks very similar. Though I think the one at the LFS was nicer. I understand from reading through some of the posts that there are certain species of Goniastrea that require little to no feeding at all, only high light and good flow. My question is, how does one determine which species falls into this category? I have two different colonies of Goniastrea, one with almost mint green centers and septa that is just a shade closer towards the brown end of the spectrum, but very little differentiation between the two, and another smaller colony with neon green centers and stark white septa (extremely beautiful). While I can clearly see feeding tentacles coming out of the smaller colony at night, the larger mint green colony send out SOOO many sweepers that you can't tell if there are any feeding tentacles under there or not. As of now, I target feed both colonies, but would prefer not to add the extra food load to the tank if feeding one of them is not really necessary except perhaps on occasion. 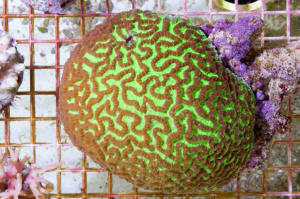 Maze brain selection 6/23/07 Hi Crew, <Hi Jason, Mich with you.> I am considering purchase of a brain "maze" coral, photo of it attached. It's quite colorful. <A beauty!> My concern is with the hole in it, near the top in the picture. <I see the hole, I'm not sure what specifically caused the hole but it does look like someone may have been living in the hole.> It's about the size of a dime. Is that a worry, <Depends on what caused the hole. It's hard to tell from a photo. If the tissue around the hole appears firm and intact, it is a good sign. If it is ragged and raw, it is not a good sign. It does not look like disease process or a recent injury to me from what I can see in the picture. But you should inspect it closely. To me, it looks like the former residence of a barnacle, which would not be concerning.><<Or... a myriad of other "lived-in" possibilities. RMF>> or should I go for it? <Only you can determine this.><<RMF would ignore the hole>> Thanks as always!